You could tell something was different when receiver Bobby Wright flew towards the Eau Claire punter just in time to swat the ball at the end of the Crush’s first series of the game. The big play placed the ball at the Eau Claire 17 yard line. Then, running back Brian Holmes took over. Four plays later, Holmes rumbled into the end zone behind a massive block from defensive lineman Jeff McGaster, and the Pioneers were on their way to their first victory of 2013. 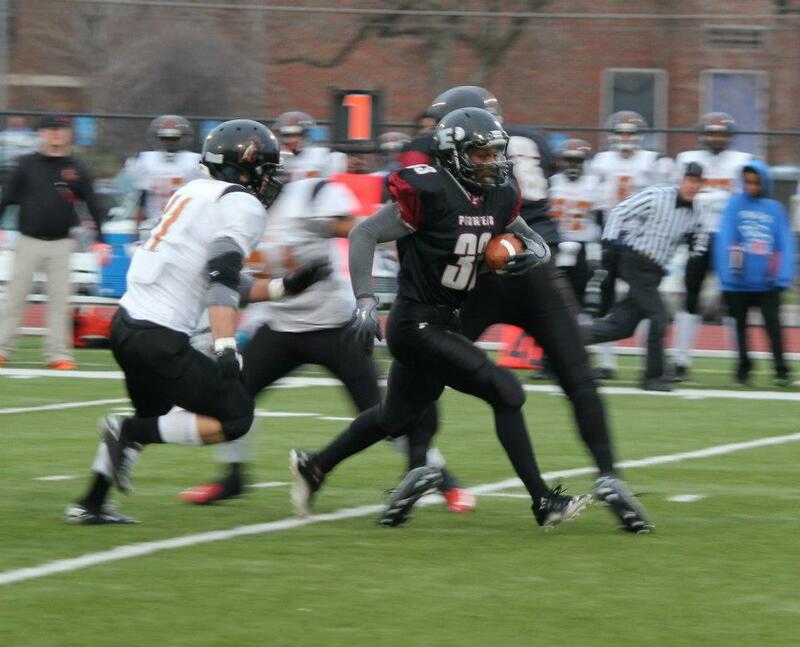 A few minutes later, Holmes was back at work when he ran in from three yards out to give the Pioneers a 13-0 lead. It would be all Pioneers all day, as St. Paul defeated Eau Claire 47-8, to improve to 1-3 overall and 1-1 in NEFL play. Yep, the Pioneers are in familiar territory again. The familiar sightings continued when cornerback Lionel Lamarre stepped in front of a Brock Pottenger pass and grabbed the ball. Then, new Pioneers running back/slot receiver Riza Mahmoud took it 83 yards for a touchdown. Three touchdowns in about eight minutes – let flashbacks to last season commence. New quarterback Cleveland McCoy and offensive coordinator Rob Neumann decided the passing game was going to join the party, too. McCoy would throw two touchdown passes, both to Mahmoud, who showcased his athletic ability when he caught the first one and ran 67 yards untouched for a touchdown. Mahmoud credited the offensive line’s great blocking as the reason for his long runs. “This week they stepped their game up, got a lot of push on the line and held their blocks and it opened up a lot of lanes for me,” he said. Mahmoud’s second touchdown came just before halftime. He ran an excellent, precise route to the right corner of the end zone where McCoy hit him right on target to make the score 34-0 Pioneers at halftime. Yes, Zero points allowed. The Pioneers defense did more than their part all game long. In addition to Lamarre’s interception, a big reason for the return to dominance by the Pioneers defense was the inspired play by new defensive lineman Ed Smith. The Pioneers have played well in spots in their three previous games, but missing star defensive ends Garrett Johnson and Cliff Gordy has not helped the cause. On Saturday, Smith showed he’s more than capable of helping fill the void. It started early when he tackled Crush running back Tommy Green in the backfield in the first quarter. He continued to make his presence felt all game long. He finished the game with four quarterback sacks among his 12 tackles and seven tackles for loss on the day. The source of Smith’s inspired play, it turns out, is found in a pre-game speech by McGaster, a team captain. McGaster talked about playing with intensity, emotion and motive. It was definitely heard. 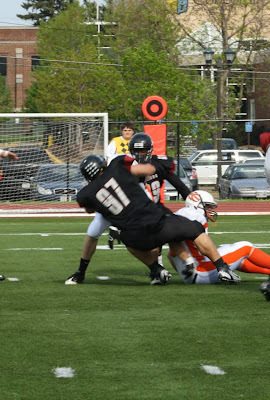 Later, in the third quarter, Smith gave the Pioneers great field position when he sacked Pottenger at the Crush 18 yard line on fourth down. It took only one play for the Crush to regret not punting the ball away. 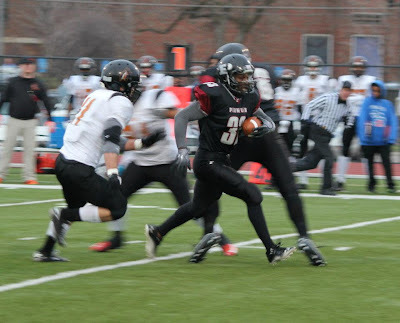 Pioneers running back Vernon Johnson covered the 18 yards in record time, scoring another Pioneers touchdown. Kicker John Ostertag’s extra point went straight through the uprights, making the score 41-0 Pioneers late in the third quarter. The Pioneers defense wasn’t done yet, though. Defensive end Val Ndikum, who also had a terrific game containing the Crush attack, tipped a Pottenger pass that was intercepted by defensive back Andre Spencer. Then the offense went back to work. McCoy threw to Marcus Foster, who eluded tacklers and ran to the left corner of the end zone for yet another Pioneers touchdown. The extra point attempt was unsuccessful, leaving the score 47-0 Pioneers. Both Mahmoud and Delane Woods had nothing but good things to say about McCoy. Woods said he thinks McCoy is great at throwing and running the ball. 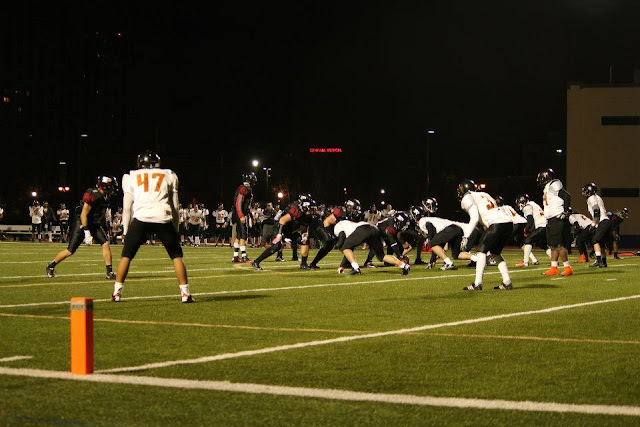 The Crush would break up the shut out in the fourth quarter, when, on Josh Gawrysiak carry, the ball came out but it was recovered in the end zone by the Crush. Pottenger’s pass to Gawrysiak for the two point conversion made the score 47-8 with four minutes left. That would be the final score of the first Pioneers victory this season. The Pioneers have a bye this week for Memorial Day. 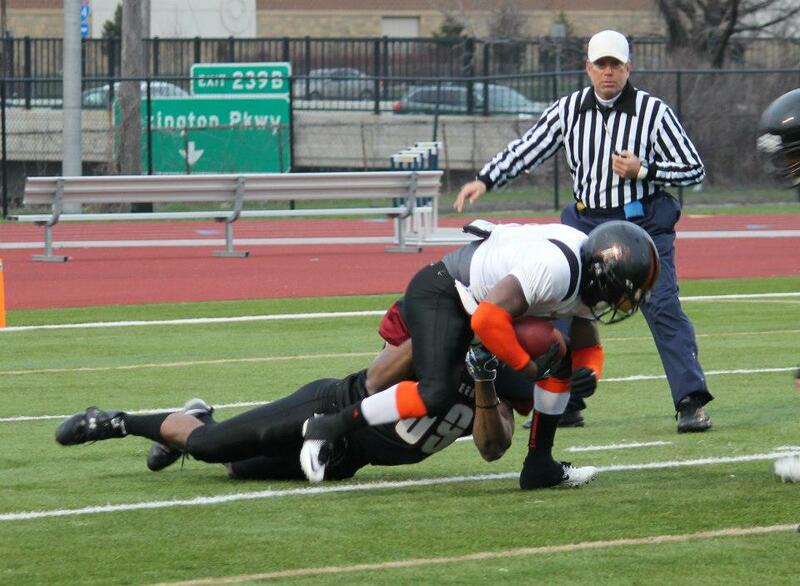 They return to action at Sea Foam Stadium on Saturday, June 1, when they take on the undefeated Lake Superior Rage. Game time is 5pm. Come join us as Mahmoud, Smith, and the rest of the Pioneers go for their second win this season! This was the presentation that Pioneers announcer Brian Schulz read at halftime Saturday during the Pioneers 47-8 win over Eau Claire. It sums up how this family feels about two of its founding members. They joined the team together, young players who played together at Augsburg College. One was the fleet receiver from Chicago, the one who could beat almost any defense down the field. The other was the unblockable defensive lineman from Milwaukee, the guy who almost toyed with guards and tackles. They were among the first Pioneers team founder Adam Gold approached to help build his new St. Paul squad back in 2002. They would be building blocks for a winner, he knew. 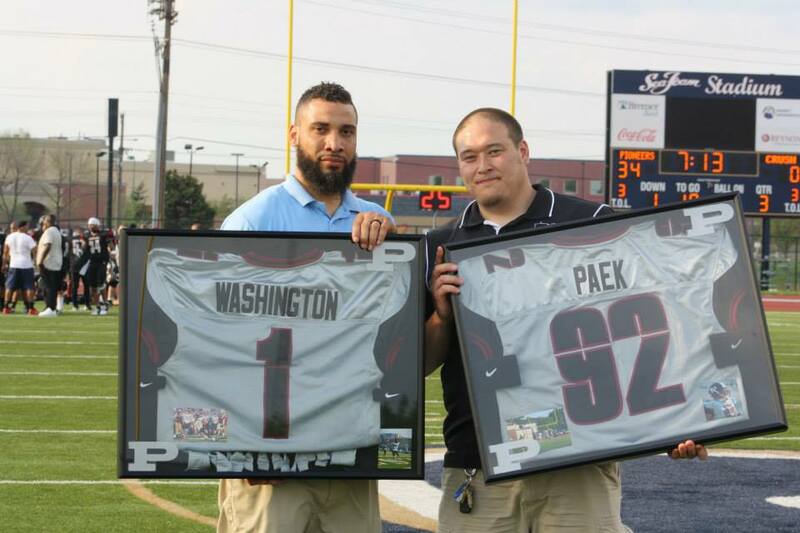 But little did he, or anyone else, know that Damien Rochon-Washington and Guillaume Paek would lay the foundation for a national powerhouse and a local dynasty that would be defined as one of the best semi-pro teams of the decade. Together, they lent their talents to the St. Paul Pioneers for 11 seasons, leading their teammates in words and in deeds. Washington, over time, would transform from the deep threat to the guy who could be counted on to get the key first down… to take the best hits a defense could deliver and bounce right back up. He became a vocal force, prodding coaches and teammates to bring their best. Expecting no less from himself. Paek, who became a teacher and a leader of young men, dominated inside early. Became an unstoppable force at linebacker for a while and transitioned to the end of the line late in his career, the man his coaches could count on to do whatever was needed to stop the other team in its tracks. They were known, all along, as close friends and as brothers. Over time, they taught their teammates the value of friendship, the priceless nature of family. They are the last of the original Pioneers to play, they played nearly every down of every Pioneers season – the many that ended in championships and the few that did not. Today, we honor these men, these builders, these football players and brothers, with the greatest honor we can give. We retire their numbers – 1 and 92 – never to be worn by another St. Paul Pioneer, in recognition of all they have done, the sacrifices they have made, the loyalty they have shown. Please join me in a round of applause for Guillaume Paek and Damien Rochon Washington…. We will always miss you on the field, but we will always hold you in our hearts for leading the way. Despite playing more inspired football during stretches of the game, the St. Paul Pioneers on Saturday could not do enough to stop their losing skid. 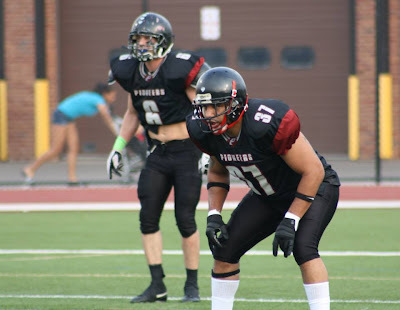 The Pioneers, 12-0 and national champions last season, are now 0-3 on the year, 0-1 in the NEFL, after a 21-13 loss to the Fox Valley Force in Kimberly, Wis.
As in previous losses, the Pioneers offense continued to struggle to find its rhythm. It started well. Defensive back Terry Jones showed the Force the Pioneers weren’t going down easily when he intercepted Force quarterback Dan Parker late in the first quarter and took it 95-yards for a touchdown. But the offense’s ongoing struggles became evident when Force Safety Travis Fischer picked up a Pioneers fumble and returned it for a touchdown. The extra point attempt failed and the Pioneers clung to a 7-6 lead early in the second quarter. The next Pioneers drive looked promising when Spriggs completed two long passes—to Delane Woods and Justin Miles—to take the Pioneers to the Force 30 yard line. The strong wind, unfortunately, wasn’t blowing the Pioneers way. As a result, Jay Harding’s field goal fell short. The Force overcame two of their own penalties on their next drive, scoring when Brett Vergin ran in from four yards out. Fox Valley ran in a two-point conversion for a 14-7 lead and, a few minutes later, threatened to score again, just before halftime. They were stuffed by a spirited Pioneers goal line stand spearheaded by defensive tackle Mark Simmonds, to keep the score 14-7 Force at intermission. Fox Valley picked up where they left off and went right back to work in the third quarter and scored again on a Josh Kasuboski touchdown, making the score 21-7. As has been the theme thus far this season, the Pioneers came so close on their next possession. A long pass to Woods and another pass to Miles brought the team within 17 yards of the end zone. Then, the Force sacked Spriggs. How did that affect him? Not at all. On the very next play, he threw an 11-yard pass to Miles. The Pioneers once again misfired in the red zone, however, and two incomplete passes gave the ball back to the Force on downs. Jones went back to work on the next Force drive. He saw the ball and went for it, breaking up a Parker pass and almost intercepting it. Defensive lineman Ed Smith helped Jones out when he tackled Parker in the backfield, making the Force punt. Later, the Pioneers defense stepped up yet again, not allowing the Force even one first down on their next possession. It wasn’t long, though, before they were back on the field again. Two plays into the Pioneers drive, Spriggs was intercepted. It looked like the Force might score again but the Pioneers defense had other ideas. The Force would gain just eight yards, derailed by their own penalties and a pass broken up by corner Brock Keaton. When Parker’s pass was caught out of bounds on fourth down, the Pioneers got the ball back. 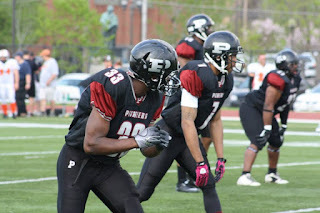 Then, the Pioneers offense found some life. First, Brian Holmes ran six yards followed by a Spriggs seven-yard run. Then, after a Force penalty, Spriggs threw to Woods, who ran to the Force 28. On second down, Spriggs threw to the end zone where the ball was tipped by the Force and then caught by receiver Marcus Foster for a Pioneers touchdown. A bad snap on the extra point attempt made the score 21-13 Force early in the fourth quarter. That would be the final score, as the Pioneers could not mount another scoring threat. 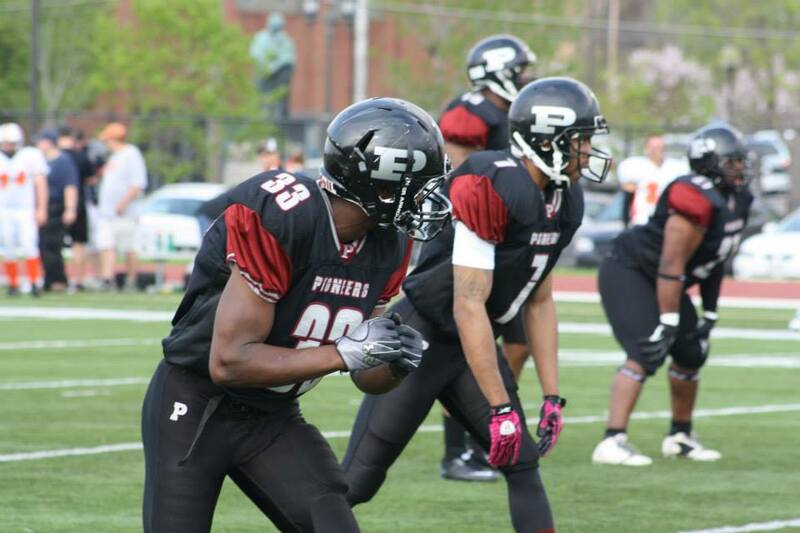 The Pioneers next chance for a win is this Saturday, May 18, when they play the Eau Claire Crush at Concordia University in St. Paul. Game time is 5pm. Come cheer on your Pioneers to victory! Note: The Pioneers will be honoring Damien Rochon Washington and Guillaume Paek at halftime by retiring their numbers. Paek and Washington joined the Pioneers in their first season in 2002 and played every year with the cardinal and black through 2012. The original Pioneers won two national championships and seven league titles in their years with St. Paul. Please join us as we honor their loyalty and their excellence Saturday night. Heading into a potentially colossal battle between two former National Champions, the St. Paul Pioneers were nonetheless confident they could topple the visiting Des Moines Blaze on Saturday at Sea Foam Stadium in St. Paul. Turns out, they would came up an inch short. After a 2012 season in which the Pioneers did not lose a game – including winning every home contest at Sea Foam – St. Paul now is an unexpected 0-2 after two pre-season contests. The Pioneers head to Kimberly, Wis., this week to open their NEFL regular season against the Fox Valley Force, the second time the teams will have played in three weeks. And, for the second time in this young season, the Pioneers started off a bit lackluster – letting an opponent take a first half lead. St. Paul actually scored first, on a safety, when linebacker Bill Quistorff tackled the Blaze ball carrier in the end zone following excellent coverage by the Pioneers kickoff team. Des Moines would storm right back, however, when the Pioneers fumbled shortly after receiving the free kick. On a 4th and 15 deep in Pioneers territory, the Blaze opted against the field goal try and instead lined up to go for it. 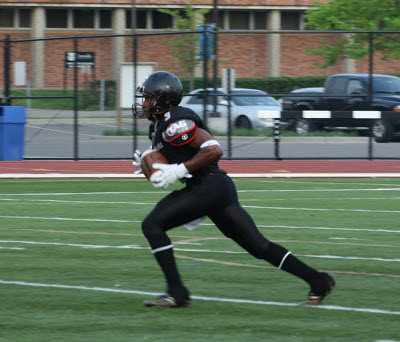 Blaze quarterback DeMareo Darrah tossed a touchdown on the play to wideout Randy Blackford – one of three Blackford scores on the day. The Pioneers answered with a touchdown of their own just a few minutes later when Spriggs threw to Delane Woods, who ran 24 yards to pay dirt, making the score 9-7 Pioneers. The rest of the first half, however, would be all Blaze. Des Moines scored again before the first quarter ended when Blackford caught his second touchdown of the day, taking this one 22 yards. Then, shortly before the two minute warning, the Blaze would score again after a short Pioneers punt. With the Pioneers defense on its heels, the halftime score was 20-9, Blaze. In the second half, the Pioneers seemed to regain some of their swagger. Starting with a couple of Spriggs passes – first to Cleveland McCoy, then to Woods – the Pioneers offense started clicking. Spriggs got in on the action too, running the ball to the Blaze 28 yard line. But two incomplete passes followed, stalling the Pioneers momentum and giving the ball back to the Blaze. Blackford scored yet again for the Blaze, going 43 yards, his longest reception of the day. Then, with their backs literally to the wall, the Pioneers defense decided that enough was enough. With the Blaze threatening to score again at the Pioneers 13-yard line, defensive tackle Jeff McGaster chased Darrah down and jarred the ball loose. Linebacker John Robinson scooped it up and ran 80 yards for a touchdown – his second TD in the first two games. The Pioneers defense wasn’t done. On the next series, defensive back Terry Jones stepped in front of a Darrah pass and, a few plays later, Pioneers running back Brian Holmes punched it in from the 1-yard line. The Pioneers two-point conversion try failed, making the score 27-22 Blaze. Still, the skilled and experienced Blaze offense, which gave the Pioneers fits all day, was not ready to fold. They drove the ball deep again into Pioneers territory, setting up the possibility of another score. But a Blaze pass into the end zone was snared by Jones. 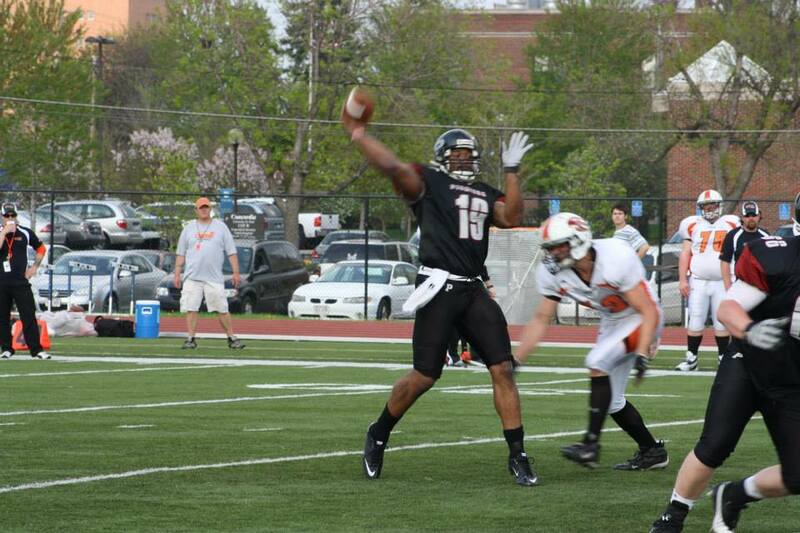 He took a knee, giving the ball to the Pioneers at the 20 yard line with the two-minute warning and two timeouts. Then, after a penalty pushed the Pioneers back to their own 10-yard line, the offense started running its two-minute drill. On third down, Spriggs hit receiver Sean Lewis with a 36-yard pass to near midfield. When asked what made the last two drives different, Spriggs said he believes the team does better under pressure. He also said the offense needs to stop putting pressure on themselves at the beginning of the game and just play football. He added that the offense needs to help the defense more as well. Another pass to Woods brought the Pioneers to the Blaze 40 yard line. Spriggs passed to Woods again, bringing the team to the Blaze 20 yard line. Then, when all hope seemed lost after two incomplete passes, Spriggs took it upon himself and ran it all the way to the Blaze 8 yard line. Eight yards stood between the Pioneers and victory. Three incomplete passes set up the dramatic fourth down play. Spriggs rolled to his right and appeared oh-so-close to scoring. But the officials ruled he was shoved out of bounds an inch shy of the front corner of the end zone with 3 seconds left on the clock. Des Moines took a knee to end the game. When asked about the Pioneers unfamiliar defensive struggles so far this season, Jones – a veteran of several seasons from Concordia University-St. Paul, said the team still is working to get nearly 20 new players acquainted with the Pioneers’ system.